Foreign workers aged 55 could stay longer in the Gulf country on three conditions including owning property worth AED2 million ($545,000), the federal government announced Sunday. The new law was adopted at a cabinet meeting chaired by Dubai ruler and UAE Prime Minister Sheikh Mohammed. Under the new law, the retired expat workers can apply for an extension of their visa under three criteria, namely ownership of a real estate investment of AED2 million, or of financial savings of not less than AED1 million, or proof of income above AED20,000 per month. “The UAE Cabinet approved a law to provide special residency-visa privileges for expat retirees over the age of fifty-five years for a period of five years, with the possibility of renewal, according to specific conditions,” the Dubai Government Media office said. The new law, Reuters notes, could help prop up the real estate market of Dubai. The new law follows last week reports that Dubai-based Emaar Properties PJSC; a real estate company, would propose investors 10-year visa as part of incentives to attract foreign investments. Emaar swiftly dismissed the reports arguing that the issuance of visas falls under the purview of the concerned authorities. 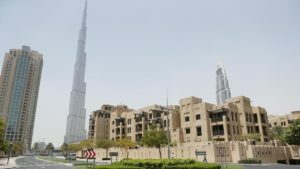 The economy of the Gulf of country is facing a slowdown and the real state sector in Dubai, according to S&P Global Ratings, could decline by 10 to 15 percent over the next two years, hit by new supply, geopolitical risks and the introduction of value added-tax in the United Arab Emirates. Written by: KanelkaTagba on September 17, 2018. Posted by KanelkaTagba on Sep 17 2018. Filed under Gulf News, Headlines. You can follow any responses to this entry through the RSS 2.0. Both comments and pings are currently closed.